The monastery Maryam Al-Adra in Sulaimaniyya. The monastery is located within the center of the city, yet one has to know where to look for it. Every day, except for Sunday, starts with breakfast. 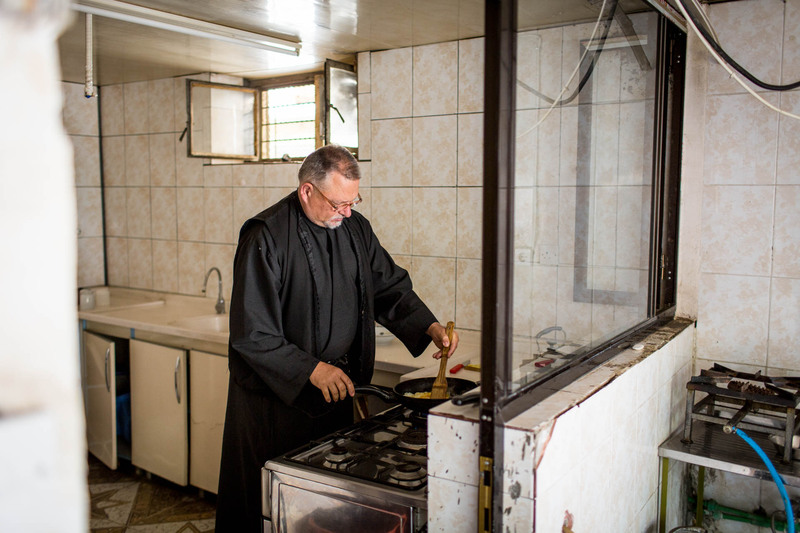 Sometimes Father Jens helps in the kitchen. 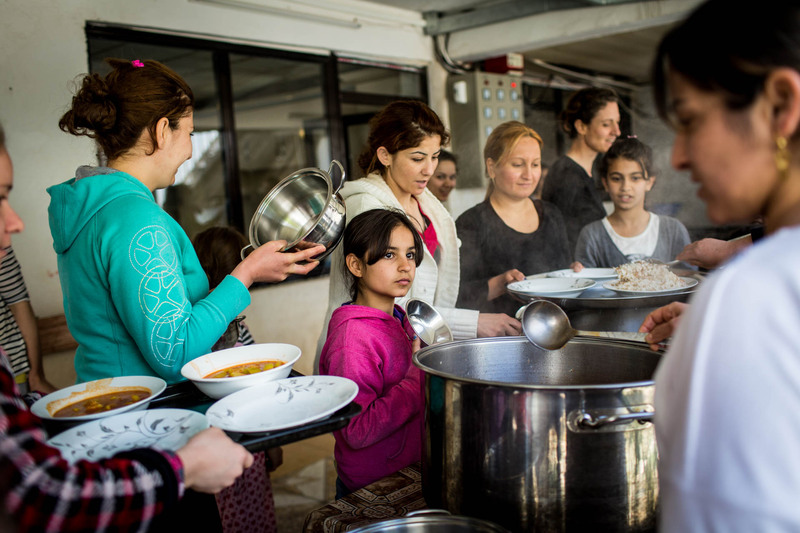 To avoid chaos, the nearly 200 people pick up their meals one after another. They usually eat in their rooms with their own families. 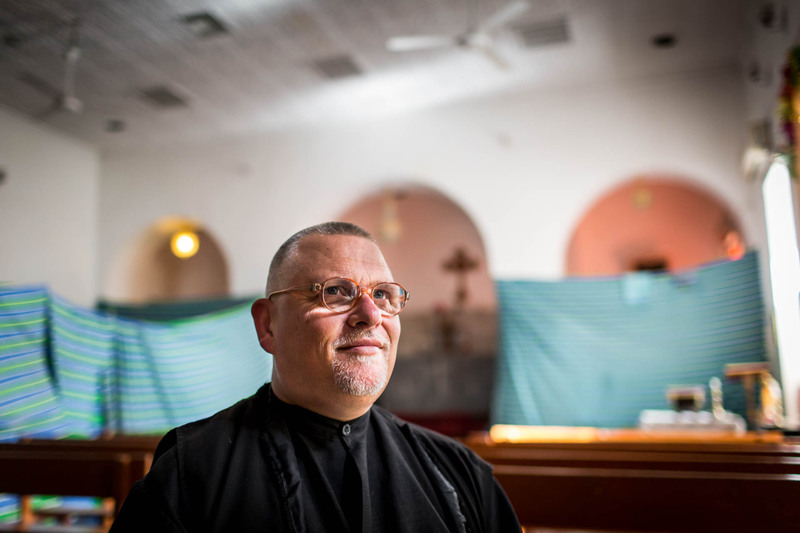 Father Jens is monk, psychologist, caretaker and fundraiser in one person. Thus, he spends most of his day on the phone taking care of things. Life and death are in very close proximity in the monastery. The old father of a family deceased after along illness and Jens organizes his burial. 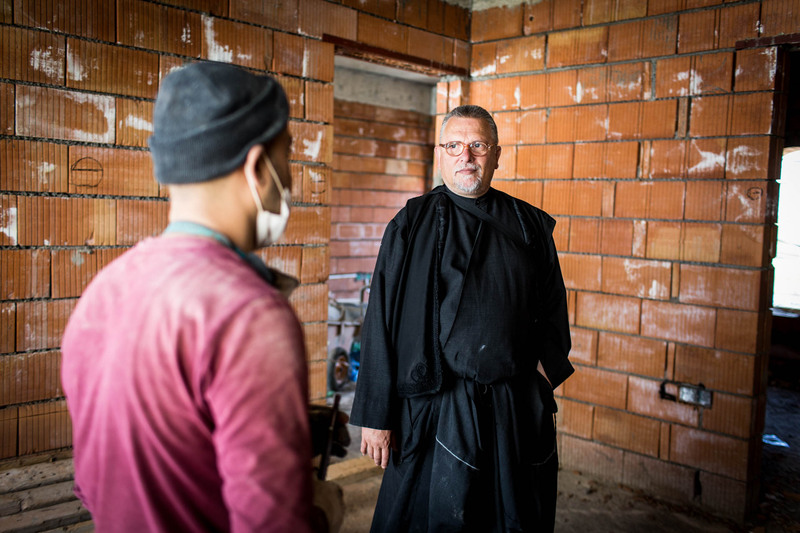 Because Father Jens is planning the construction of a new building to extend the monastery, he personally visits the construction site regularly. 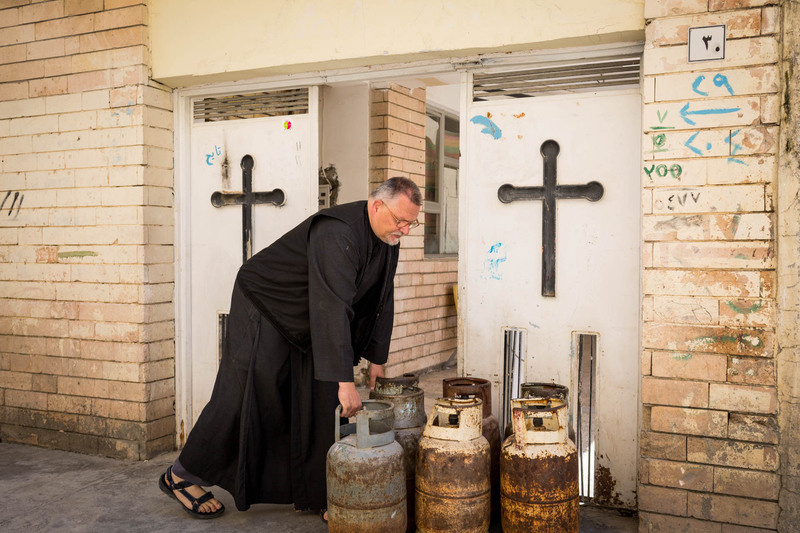 Jens is not employing any helping hands in the monastery, therefore he also takes care of the weekly gas delivery. The monastery holds little space for the almost 200 guests it is housing, so every available area is valuable. 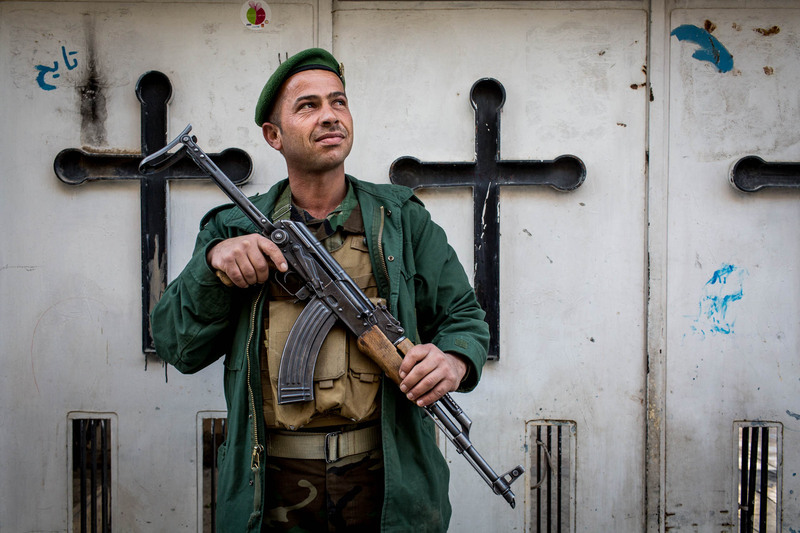 An armed guard is protecting the monastery 24/7. There was never an incident, but the city municipality would like to keep it this way. 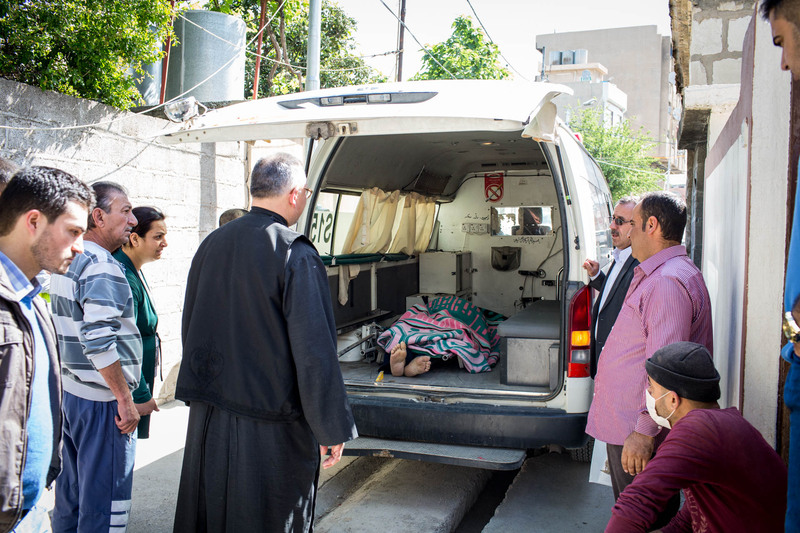 Father Jens talks to the relatives of the previously deceased in Erbil. 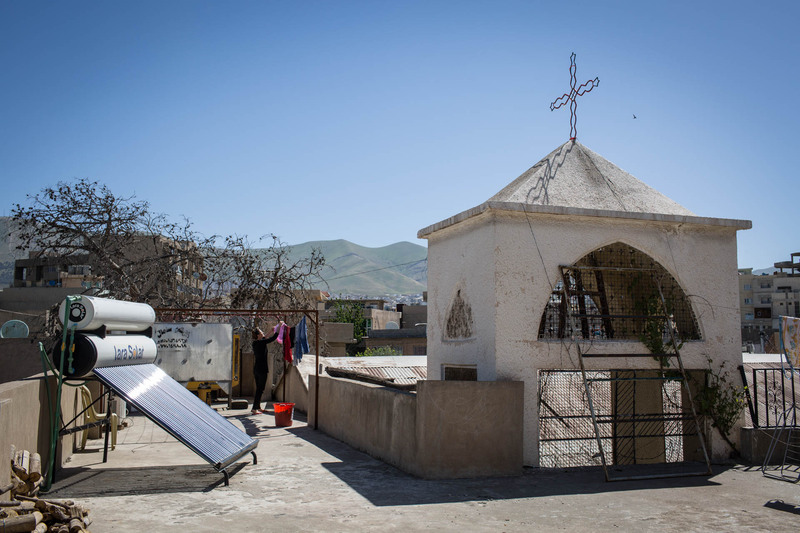 Since the Christian refugees want to be buried in their IS-occupied hometowns, they have to be buried in a temporary cemetary in Erbil in the meanwhile. Jens is preparing for a sermon on Sunday morning. A refugee helps Father Jens with preparing the sermon for this morning. 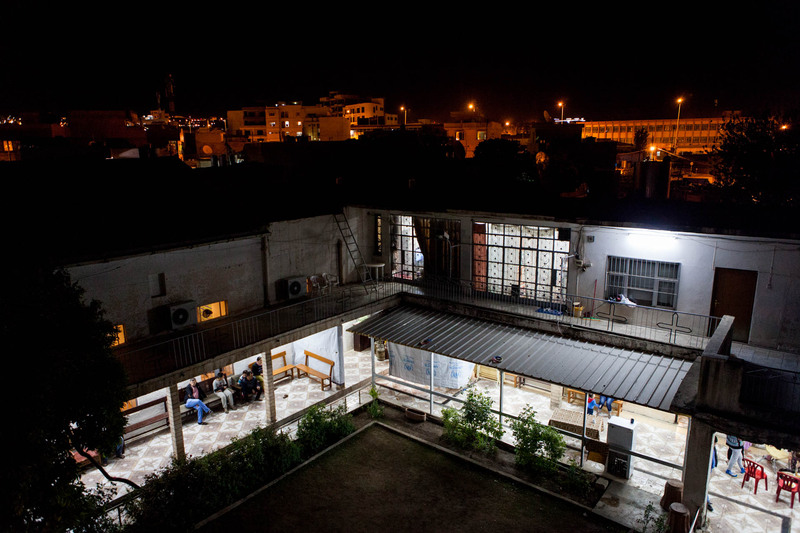 Despite the situation, the church still serves as a sacred place. 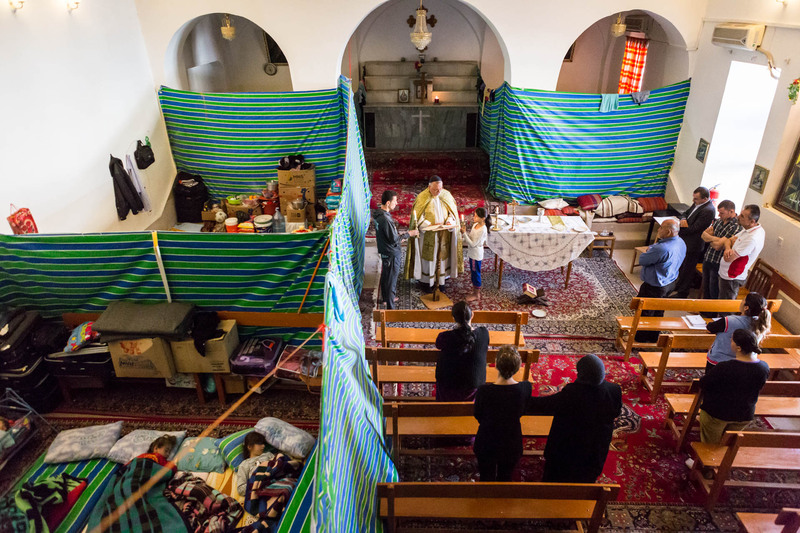 With four families living in the church, separated by panels of fabric, Father Jens holds a service on Sunday morning. 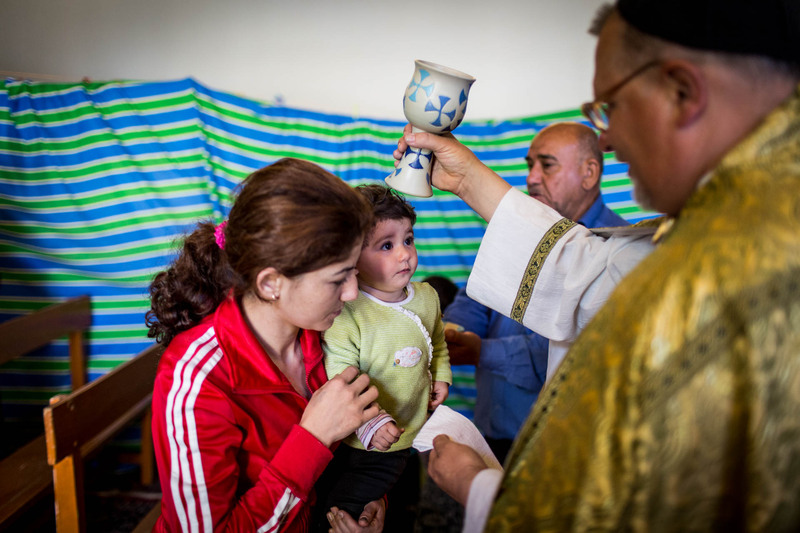 A little girl receives a blessing from Father Jens during Sunday service. A woman hangs laundry on the roof. In the background are the mountains separating Iraq from Iran. Jens' guests had several professions before their exile. Some of these skills now come in handy at the monastery, for example when Jens needs to trim his beard. Father Jens thanks the women that cooked todays lunch. With very limited resources, the meals are usually very basic. Today it was rice with potatoes. 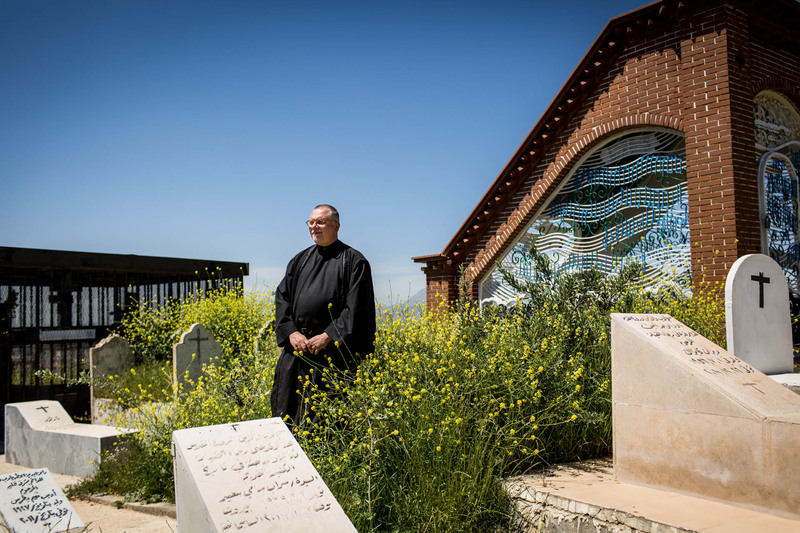 Father Jens stands in the only Christian cemetery of Sulaimaniyya. 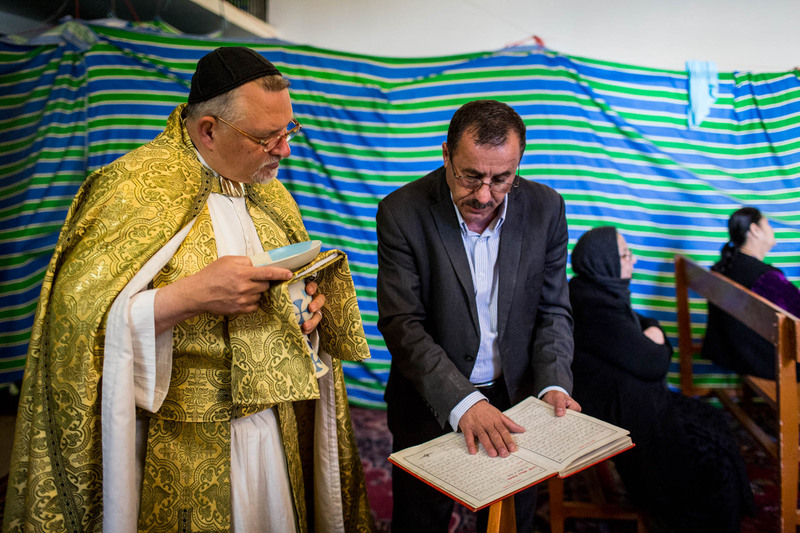 The city with two million inhabitants has a tiny Christian community, only two other churches exist. The monastery at night. Some people sit outside and chat while enjoying tea. Sulaimaniyya can be seen in the background. 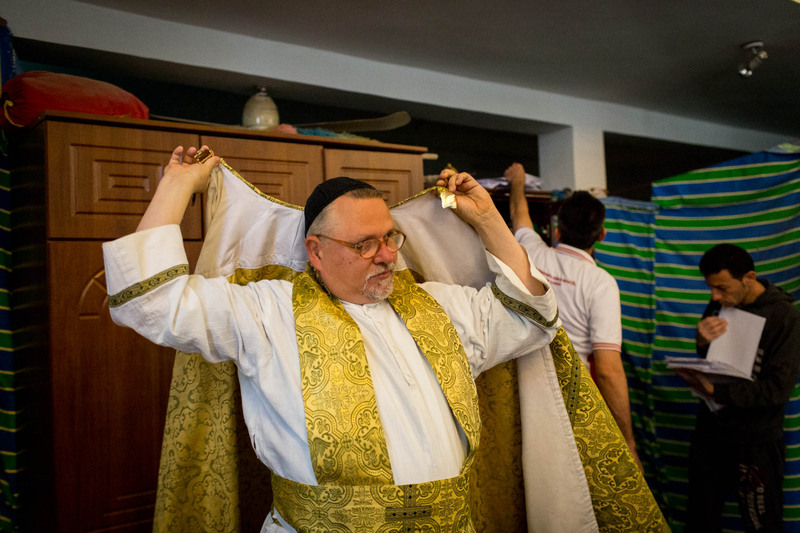 Father Jens Petzold in his church. 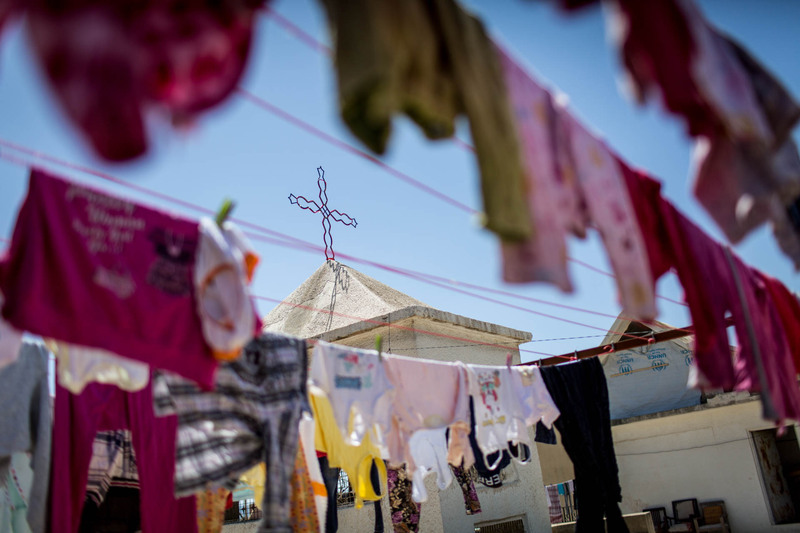 When the Islamic State conquered Mosul in summer 2014, thousands of Christians living in the Niniva province around Mosul had to leave their homes. 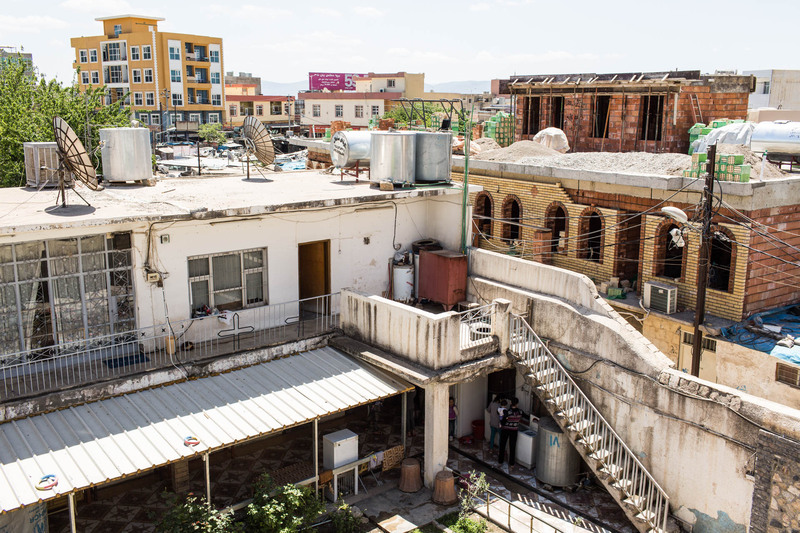 Most of them sought refugee in Kurdistan’s capital Erbil. 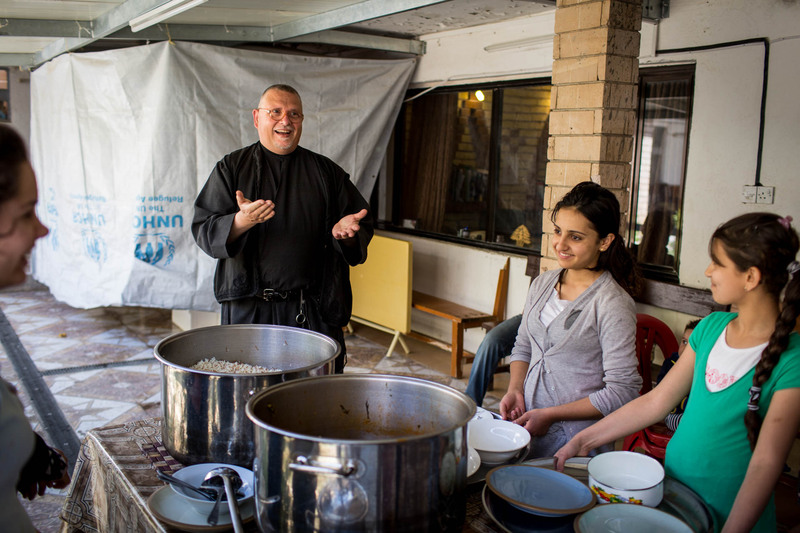 With the refugee camps over capacity, the Christian Father Jens Petzold from offered his help. 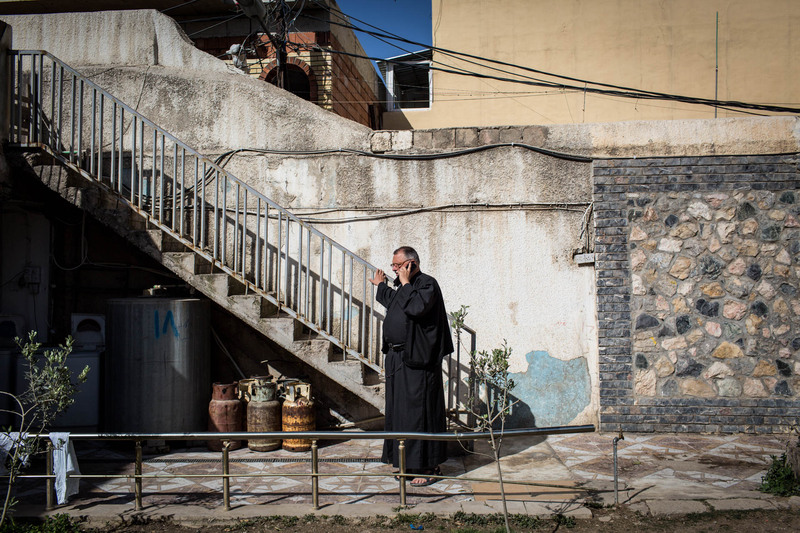 He is the Father of the small monastery Maryam al-Adra in the city of Sulaimaniyya in Kurdistan, Iraq. 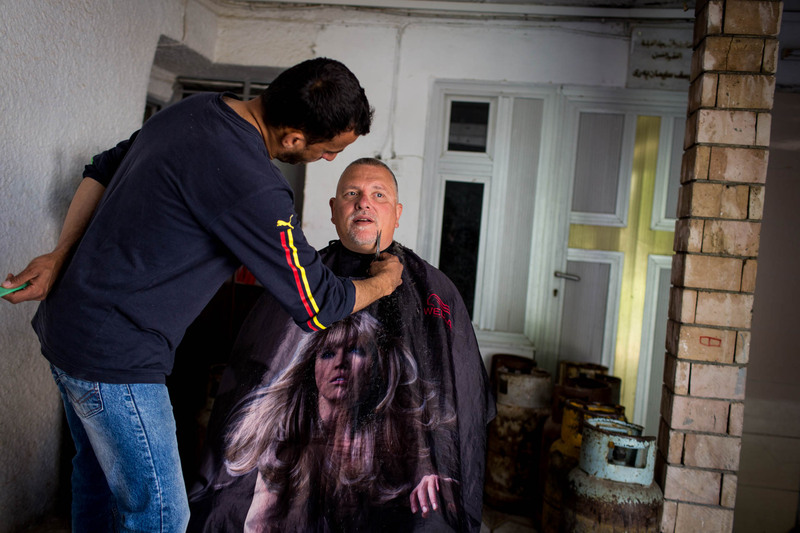 He offered to help some 200 people from the Christian city of Bakhdida, which he is now hosting in his monastery. 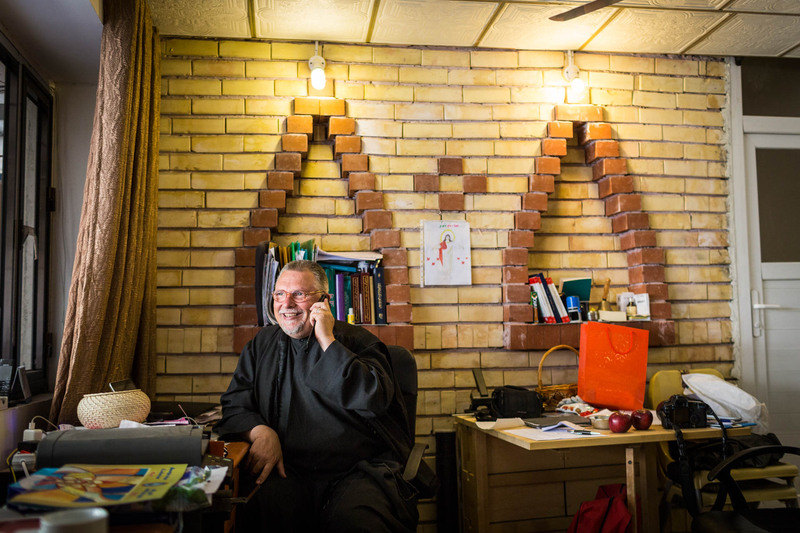 With limited funds, Father Jens is only able to finance the monastery with rigorous organisation, and now he is able to care for roughly 200 people with around 1000$ a week.